HTC One (M8) Android OS (version 7.0) Nougat is now available for the device's users. The phone was long launched in 2014. And after the launched year, the next upper year which was 2015, magenta carrier rolled out the Marshmallow update for the device. 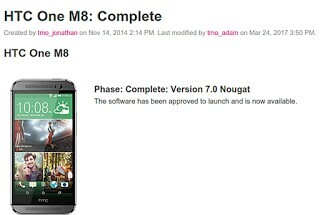 Now, T-Mobile is rolling out another latest update for the device called Android 7.0 Nougat. This latest update which is now available for HTC One (M8) smartphone has proven that the manufactures known to be HTC still care for their old users unlike other brands like Tecno, Infinix, Itel, that doesn't push updates to their old phones. Smartphones like Samsung, HTC, LG, Gionee, Xiaomi etc are preferred instead the above mentioned that doesn't push latest update to their old users. That's by the way. The following is the summary of HTC One (M8) features. The device is a 5-inch Android smartphone that has a Snapdragon 801 processor, with 2GB RAM and 16/32gb internal storage memory. The phone is embedded with a 4MP camera and 2600mAh battery capacity. Like I stated above, the update just started and would get to every unit of the device's brand. So if you have the phone or you know someone using it, just go ahead and inform them about it, while you get yours updated. You can check your phone to know whether the update is ready for the device or not.